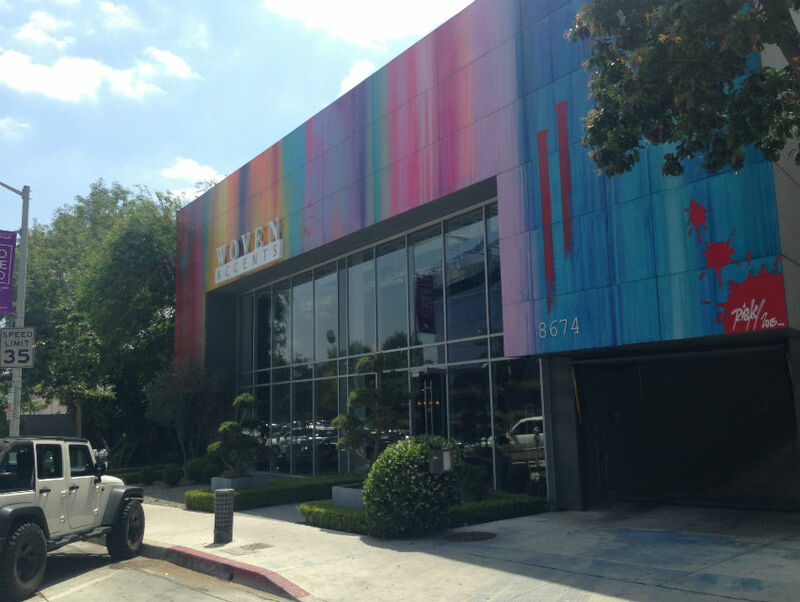 Kelly Graval, aka RISK, just completed a stunning wall on Melrose Avenue at Woven Accents. It’s worth braving Melrose traffic to stop and really immerse yourself in the deliciously drippy pastel hues RISK utilizes. WHO: RISK is a staple in L.A.’s art community. He is as at home in a fancy gallery as he is in a back alley. In fact, his background is in fine art but that doesn’t make him ostentatious. RISK takes his training into the streets where he treats an entire building with the same care as a canvas. He’s said there really is no distinction. WHAT: West Hollywood embraces Los Angeles artists, so it’s no surprise that RISK finds himself working there amongst the elite artists in the street art world. Just down the block, at the West Hollywood Library, are works by Kenny Scharf, Shepard Fairey, and RETNA. This wall by RISK pulls off using many different colors while making the work seem effortless. It’s as if RISK came long with a large paintbrush and just painted the town to his liking. In reality, the work is much more precise and technical. RISK doesn’t forget to have fun, though. He adds his signature with a splatter of red paint. Boom. He’s out.